I thought I would give you a sneak preview of one of the new applications that will be available shortly via my forthcoming subscription service. The new service will be live shortly and will have 10 products available with more being added shortly. I have a FEW cool ideas up my sleeve which are in development. Members will be able to download and access ALL products for just $17 per month. No other costs involved! 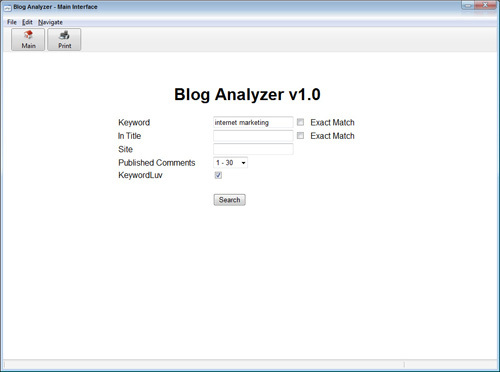 The product shown below is just one of the 10 products and is called ‘Blog Analyzer’. 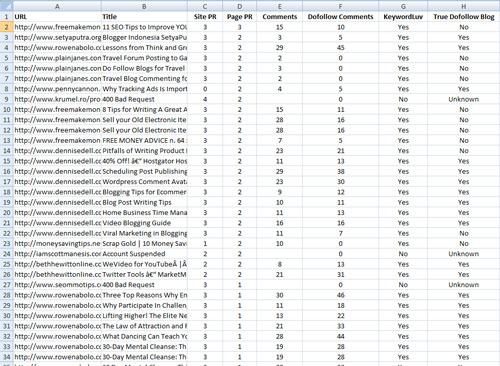 This software allows you to find blogs relevant to your niche. It will identify the domain PR, blog post PR, extract the title, identify the number of published comments, identify whether the blog is a true dofollow blog and it will also extract the published comment dates so users can determine the likelihood of getting their own comment approved for ANY particular blog. Prior to extracting the blog post URLs, users can specify whether the blogs should have the ‘KeywordLuv’ plugin installed to enable users to enter keywords for their anchor texts. Users can also specify the maximum number of published comments the post should have. All data can then be exported as a CSV file ready for sorting and filtering via Excel or similar software. If users find a great blog for obtaining a backlink from they can explore the rest of the posts from that blog with a single click of their mouse. There is an ongoing debate going on about the effectiveness of blog comments and whether they can help increase search engine rankings. The truth is that unexposed, high PR, moderated blogs can offer great SEO benefits. These are basically active blogs that have authority and do not allow spam comments to get published. In my opinion it is always worth while making a good, valueable comment on a blog in return for a high quality link. This software allows you to do just that. I’m hoping to have the subscription service live within the next 7 – 10 working days. Please feel free to leave a comment and offer your feedback. Yes, KeywordLuv blogs are tailored for giving ‘keyword rich’ backlinks. The software does try and identify ‘true’ dofollow blogs anyway though and shows that data in the exported CSV file. That way once you have analyzed all your blog posts you can filter the results to show ONLY the blogs that offer ‘all’ commenters a dofollow link… if a user so chooses to do so. I did also have a similar version that shown the backlinks for EACH blog post but with Yahoo Site Explorer no longer available I have removed this. Something similar might be added in the near future if there is a good solution. Andy, subscription? what about the old one time fee that all of us love instead of getting sucked into a monthly subscription? I mean for this software it would be nice to have an option to buy it, otherwise there is scrape box and many others already doing what this will do. I’ve decided to go down the subscription route but to offer everything for one low monthly fee. In a couple of months or so this will include about 17 software applications… and also include my content network. Content networks alone cost people upwards of $47 per month… I’m offering everything for only $17 per month to make it affordable to everyone, plus I’ll be adding to the software library regularly. On top of that there will be access to videos and case studies. As far as subscriptions go.. I wouldn’t say this is bad value at all. Sounds awesome and $17 per month sounds like an awesome deal. Can’t wait to join as when used correctly will get solid backlinks. Hi Andy, looks good, but I would not pay a monthly fee, I already have some great blog finding and commenting tools which I only paid a one time fee, sorry mate not for me. Hi Len, no worries but I think you are missing the point of what I’m offering. I’m not charging monthly just for this particular software… but rather for a wide array of desktop software and online applications. Also, new software apps will be added on a regular basis so the pool of software will grow. 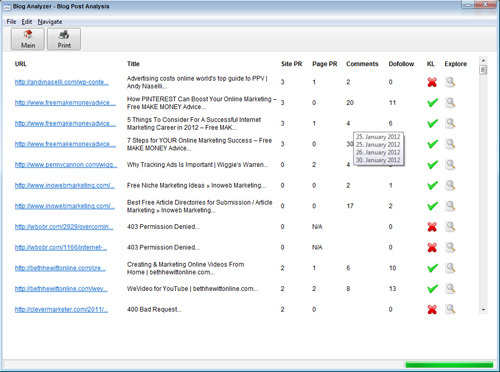 Coupled with the content network… potential auto responder… fresh content rotator system etc etc.. I don’t think $17 per month (with no large up front purchases or fee’s) is too unreasonable. But each to their own and it’ll be upto the individual whether they think it is worth subscribing too. I have a nearly dead blog that I neglected for a few months and found it was still bombarded by spam because of the dofollow plugin (comment luv). Who needs all that crap? I read a post and comments. Smart, insightful, genuine comments get my attention and I’m likely to see what more that commenter may offer by taking the time to visit their site. The link is more valuable for ranking, sure, but I don’t mind some exposure and actual visitors either.